Remarkably quick and effective cleaner for the exterior paint and wheels - now in lemon scent! Also available in Cherry Scent! 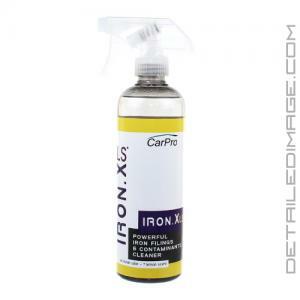 If you need the most effective exterior cleaner on the market the CarPro Iron X Iron Remover is the product you simply must have! With one quick treatment you can remove the vast majority of contaminants on your vehicle's exterior surfaces with little to no work. This gentle formula is pH neutral yet incredibly effective at removing build ups even the naked eye can't see. Mist it on the paint, wait 5 minutes and wipe it with a damp sponge or skip the sponge and move on to a thorough rinsing. Upon completion you'll be stunned at how much has been removed with so little effort. It can reduce the amount of contaminants your clay bar can remove by as much as 80%. This will save you a ton of time in the clay bar process and enhance the results from your polish, glaze, sealant and wax used afterward. The improved formula also has a new lemon scent! So stop using multiple products to achieve mediocre results, pick up the Iron X today you will love it! To use this product we first recommend washing the vehicle to remove the loose particles, although Iron X can either be applied onto a dry surface (before washing - lightly contaminated vehicle), or when the surface is wet (after washing - highly contaminated vehicle). With the vehicle cool to the touch and in the shade shake the bottle thoroughly and mist it on the exterior of your vehicle. We target the wheels and exterior painted sections as that is where it's most effective. It's designed to be safe on the trim and the rest of the exterior but with any new chemical you can do a test spot if you want to be certain. Wait five minutes and wipe the area down with a damp sponge and you'll see the formula turn to a deep and dark red/purple color. After that you can remove it with a damp cloth or thoroughly rinse the vehicle down and you are done. The surface should look and feel much cleaner now! If you enjoy the Lemon Scent, check out the Iron X Cherry Scent! For car paint, wheels, glass, & plastics. Spray on, wait 3-5 min. while contaminants change color to purple-red. Rub in with damp, soft sponge. Avoid drying under direct sun.